We all seem to have at least one person in our lives whose favourite sound is a tired sigh, whose favourite look is crestfallen and whose favourite pastime is sitting head-down being melancholy. 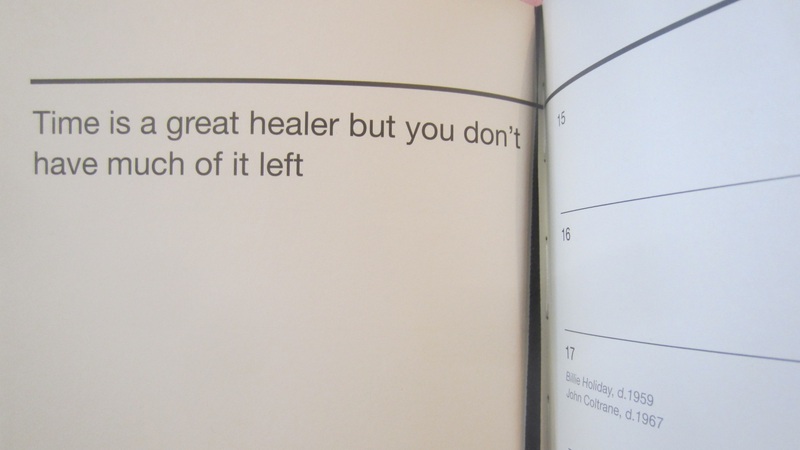 Enter The Perpetual Disappointments Diary! It’s filled with so much doom and gloom that maybe two negatives will turn into a positive! It’s bound to put a mild smirk on the face of even the most forlorn character! Each week starts off with a (un)inspirational quote. The front of the book is full of useful phrases translated into French, German, Spanish and Mandarin. Now your friend will be able to save themselves out of whatever disaster is sure to befall them next. (“I have destroyed my rental car” or will never be misunderstood again. You’re welcome!) There are also helpful Conversion Factors. Your friend will now know what constitutes an alarming fever and reassurance that 1 glass does, in fact, equal 1/2 empty. The back has space to record such delights as People Who Never Call, Notes Toward A Boring Blog Post and a helpful space for Passive-Aggressive Notes. Apparently the forecast calls for another dreaded sunny day today…hope yours is great(-ish)!